As with all intercooler hard-pipe kits, the stock rubber hoses to the intercooler are replaced with solid pipes to eliminate distortion under boost. But the devil is in the details, and that is where similarities end. 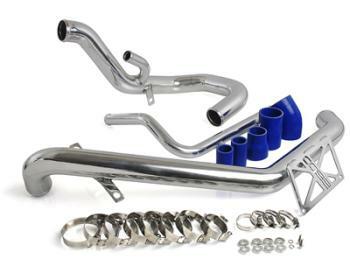 The COBB Tuning Intercooler Hard Pipe Kit consists of single piece pipes made from mandrel bent aluminum tubing on both the cold side and hot side of the intercooler. The results are weld-free pipes from the turbo outlet to intercooler inlet and from the intercooler outlet to the throttle body, without unsightly mid-pipe silicone hose couplings that can disrupt flow or potentially blow off under boost. COBB Tuning Intercooler Hard Pipe Kits are available in gunmetal powder coat or can be special ordered in high polished aluminum finish. Painstaking effort goes in to the fabrication, handling and packaging of our high polish kit, ensuring the parts arrive with a beautiful unblemished finish.